This work in progress is a list of places visitors to Vancouver Island can check out for any particular popular culture craving. This index is by no means complete, as there’s most likely a few not as well-known. This list does not include franchise businesses like EB Games. We are encouraging those coming to this fair city to buy locally. If there’s an operation not listed, please either comment or send us an email so we can update. This document is broken into separate ‘pages’ / sections. Please note the page number count tucked in the bottom to read. This operation specializes in carrying a diverse range of product for everyone of all ages. From products for young girls, like Barbie, to collectable products (like original packaging G.I. Joe), if you name it, that item might be hiding here! Not only is it the only place to find a few arcade games (cabinets and pinball) but also it’s the home to an always growing toy museum! This exhibit is located on the second floor and it spotlights the history of many a playful product from the past 100 or so years. If you look carefully, you can find also props used from certain television series, namely Stargate SG-1. With three locations to serve most of Vancouver Island, Curious Comics makes up the heart of Nerd Row in Victoria, BC. Stepping in here is a paradise of goodies. From CGC certified comics to Walking Dead merchandise, a lot of collectable franchise properties can be found here. Yes, they also sell a limited selection of board and role-playing games. Technically a big box operation, this business deserves a special place as having been part of the local nerd scene for a long time. Games like Blood Bowl and Lord of the Rings shows how well this company rules them all. Their prices, say what you will, has to pay for the licensing they have to pony up to maintain their high quality of miniature building and craftsmanship. 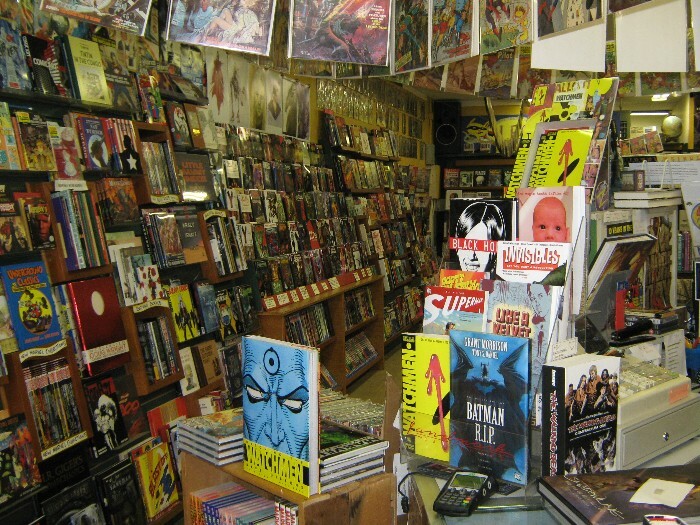 Coming into this bookstore to find that gift for the comic book enthusiast is a must. The diversity is huge, and the selection is a mix of rustic to modern. The love for the medium can be seen everywhere. Books are organized by publisher and artist! For the true collector, co-owner Gareth does have a side operation to preview the truly vintage material. An appointment is required. He also runs workshops for up and coming artists of all ages (mostly youth). Remember the days of visiting an arcade center to play the latest in cabinet style arcade games or play pinball? They are not gone with this operation replacing a former art studio, once a tattoo shop and the storefront to Absolute Underground Magazine. They just moved to better digs or just do not need the space anymore. Found here is one of a handful of cabinets featuring a rare game: Fix-It-Felix from the Wreck it Ralph movie! Other games include Atari’s Centipede and even the latest Terminator: Salvation shoot ’em up. In the pinball front are AC/DC Pro, Medieval Madness and Attack from Mars! This place plans on offering game tournaments and special events. Announcements will be made through their newsletter. This place is better known as one of two places to buy your Magic the Gathering cards, old and new, and all the supplies related to it. Walking by this place may seem scary to some since it’s card central than comics, but they still have space to sport the mainstream titles than to carry a wide range. Plus, it is the place downtown to sit down to play a game or two of MtG. They host daily evening events. Need your Dungeons & Dragons? The Vorpal Gnome (located upstairs in Cavity) has one heck of a selection! Coming here to dungeon crawl is a must. Upstairs is a wide range of used and new role-playing games material, with plenty of classic Dungeons and Dragons books to make a red dragon second guess if his horde is bigger than the stores. Also, used miniatures can be found here. The love of pen and paper gaming is evident in the selection here, and if you keep checking in, perhaps that D&D module you once played from long ago might make an appearance in the racks or shelves here. Downstairs lurks a wide range of product ranging from books to music (punk rock, heavy metal) of bands. Some are obscure and others are not. But this operation is a curiosity shoppe for a reason. You never know what you can find! There’s a whole lot of vintage funk to be found lurking here.